Bruce is buffing his nails! Keeping Up With the Kardashians patriarch Bruce Jenner stepped out for a Starbucks run in Malibu, Calif. on Wednesday, Dec. 3, looking polished and pampered. The 65-year-old former Olympian was sporting two large diamond stud earrings, a black zip-up hoodie, and a new French manicure. See more photos from Bruce&apos;s outing! Jenner was still wearing his wedding band more than a year after he and now-estranged wife Kris Jenner announced their separation and months after both filed for divorce. The father (and stepfather) to the Kardashian-Jenner clan also appeared to be wearing lip gloss and tinted sunglasses. In late October, he showed off a bright red manicure on his birthday, before quickly removing the polish once photos of the look hit the Internet. “His goal is to live as a woman and look as much like one,” a source close to the family tells Us Weekly. “He has been struggling for a long time with his feelings about being a woman inside.” See more pics of Bruce&apos;s changing look. 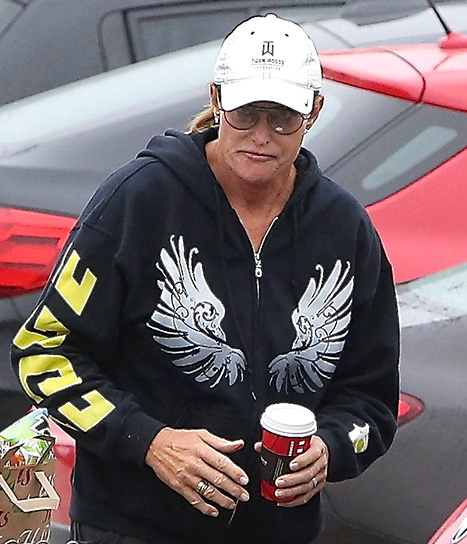 Tell Us: What do you think of Bruce Jenner’s new look? ?